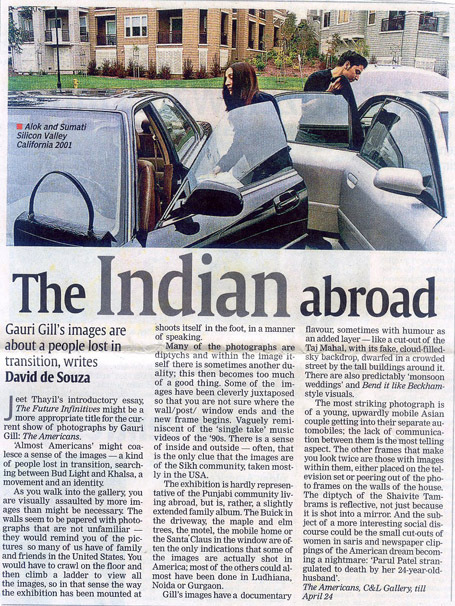 Jeet Tahil’s introductory essay The Future Infinitives might be suggestive of a more appropriate title to the current, Gauri Gill’s show of photographs, The Americans. “Almost Americans”, might coalesce a sense of the images, a kind of people lost in transition searching between Bud Light and Khalsa, a movement and an identity. As you walk into the gallery you are visually assaulted by more images than might be necessary. The walls seem to be papered with photographs that are not too unfamiliar from the ones most of us have of family and friends back in the USA. You would have to crawl on the floor and get a ladder to see, really view, all the images, so in that sense, the way the exhibition has been mounted at Chatterji and Lal’s gallery shoots itself in the foot. Many of the images are diptychs and within the image sometimes there is another duality, this then becomes too much of a good thing. Some of the images have been cleverly juxtaposed where you dont know where the wall/post/window ends and the new image begins. Sort of reminiscent of the ‘single take’ music videos of the 90s. There is a sense of inside and outside and sometimes that is the only clue that the images are of the sikh community mostly in the USA. The exhibition is hardly representative of the Punjabi community living abroad but rather a small, almost, extended family album. The Buick in the drive way, the maple, elm, the motel, mobile home or the santaclaus in the window are often the only semiotics to indicate that the images are actually shot in America, most of the others almost could have been made in Ludhiana, Noida or Gurgaon. The images are of a documentary nature, sometimes the document is almost funny this is represented by a cut out of the Taj, with its fake, cloud filled sky backdrop, dwarfed in a crowded street by the tall buildings around. There are predictably almost ‘monsoon’ weddings, and ‘Bend it like Beckam’ visuals. The most striking photograph is of a young upwardly mobile, Asian couple getting into their separate automobiles, the lack of communication between them is the most telling. The other photos that make you look twice are the ones with images within them either on the TV or peering out of the photo frames on the residential walls. The diptych of the shivite, tambrams is reflective not only because its shot in the mirror. And what might be the subject of a more interesting social discourse is of small cutouts of women in saris with news paper clippings, of the American Dream becoming the Nightmare, ‘Parul Patel strangulated to death by her 24 year old husband’. While the west initially was in search of India, it is Ironic that Indians are in search of the west now when it seems almost unfashionable. Identities and resulting crises are not new to humanity nor is migration. Every single person on the planet except those still on the plains of Kenya is a product of a migration. This brings with it an unsettling and a certain amount of uprootedness. Columbus, 500 years on, might be at the heart of all this brouhaha yet, with Annu Palakunnathu Matthew’s show of photographs indicating to us in India that all those who followed Christopher into the melting pot still cant quite tell who the Indian is. Will the real slim shady please stand up, please stand up? Some years ago Stephen Kapur reminded us that he was an Apache Indian living in Brighton or Birmingham or something Punjabi sounding like that. Ms. Matthew Malayalee is keen to indicate that if its a dot, then duh, its indian from curry land and if its a feather, then there is a reservation on your scalp. The photographs might have been entertaining Cindy Sherman or Pushpamalaesque, in no small measure due to the captions which are deprecating and patronising with their original collonial overbearingness. Ms. Matthew somehow trivialises the issues of background, where she substitutes herself most often into a vintage photograph repudiating the history of the ‘noble savage’. Words like ‘diaspora’, speaking of indians in search of a brighter economic future devalue the jewish experience; and ‘gaze’ and ‘conceptual’ trip too easily off a wanna be intellectuality. Deshi goes mod. In addition to ABCD and brown being the new red, this is yet another tale of a legal alien, an indian in new york. ……and Memories of India made with a Holga, (yawn), hi-brow cavorting as anti-brow are good enough to join the millions of other cultists on Flickr.